"Wherefore, with the help of these, king Benjamin, by laboring with all the might of his body and the faculty of his whole soul, and also the prophets, did once more establish peace in the land. And now there was no more contention in all the land of Zarahemla, among all the people who belonged to king Benjamin, so that king Benjamin had continual peace all the remainder of his days." Most readers of the Book of Mormon know the story of Martin Harris and the 116 lost pages, and many of us would probably like to read something from those pages. Though we probably will not be able to do that anytime soon, we may be able to do the next best thing: read the “retained portion,” or what the Lord called “that which you have translated, which you have retained” (Doctrine and Covenants 10:41, emphasis added). The idea behind this theory is that our current version of Mosiah starts in chapter 3 and Martin Harris lost most of the first two chapters of Mosiah with the rest of the 116 pages. But part of the original Mosiah 2 may have survived and mislabeled as part of Words of Mormon. This would be a perfectly good ending to Words of Mormon, yet it continues with something seemingly unrelated, “And now, concerning this king Benjamin—he had somewhat of contentions among his own people.”4 It then continues to talk about King Benjamin for the next six verses without coming to a conclusion. king Benjamin, by laboring with all the might of his body and the faculty of his whole soul, and also the prophets, did once more establish peace in the land. And now there was no more contention in all the land of Zarahemla, among all the people who belonged to king Benjamin, so that king Benjamin had continual peace all the remainder of his days. This seamless flow from Words of Mormon 1:18 into Mosiah 1:1 suggests that Words of Mormon 1:12–18 might have originally been part of the book of Mosiah. While it may seem odd to only lose part of a chapter, this could be explained by the way the 116 pages were likely put together. Royal Skousen has concluded that the next gathering would have contained part of the original second chapter of Mosiah.10 Thus, when Martin took the first five gatherings with him, he left part of Mosiah 2 behind because it was on the next gathering, thus leaving a portion behind. It is impossible to be certain whether Words of Mormon 1:12–18 is really part of Mosiah or not, and not all scholars agree with this theory.12 If it is correct, however, both the Words of Mormon and the book of Mosiah make a lot more sense.13 Suddenly Words of Mormon 1:1–11 forms a self-contained book with a logical introduction and conclusion. At the same time, it becomes clear that Words of Mormon 1:12–18 flows into Mosiah 1, making the earliest surviving chapter of Mosiah easier to understand. This reading also shows the long-lasting effects of a righteous king and true prophets on the society.14 Once King Benjamin and the prophets “did once more establish peace in the land” (Words of Mormon 1:18), King Benjamin “had continual peace all the remainder of his days.” 15 After King Benjamin’s armies had dealt with external threats, he then dealt with internal problems, such as false prophets.16 Reading these texts together shows that his own preaching and that of the true prophets led to a peace that lasted until his death. When we read the Book of Mormon carefully, even the small details begin to shape our understanding of the gospel. Understanding the relationship between Words of Mormon and Mosiah can help us all to understand King Benjamin and the Book of Mormon a little bit better. Even though we may not be able to read from the 116 pages, knowing that Words of Mormon 1:12–18 might be a small portion of what Joseph and Martin translated together changes the way we read these verses. Jack M. Lyon and Kent R. Minson, “When Pages Collide: Dissecting the Words of Mormon,” BYU Studies Quarterly 51, no. 4 (2012): 120–136. Brant A. Gardner, “When Hypotheses Collide: Responding to Lyon and Minson’s ‘When Pages Collide’,” Interpreter: A Journal of Mormon Scripture 5 (2013): 105–119. John A. Tvedtnes, “Covering Up the Black Hole in the Book of Mormon,” Review of Books on the Book of Mormon 3, no. 1 (1992): 201–203. 1. See Jack M. Lyon and Kent R. Minson, “When Pages Collide: Dissecting the Words of Mormon,” BYU Studies Quarterly 51, no. 4 (2012): 120–136. For previous argument along similar lines, see John A. Tvedtnes, review of Covering Up the Black Hole in the Book of Mormon, by Jerald and Sandra Tanner, Review of Books on the Book of Mormon 3, no. 1 (1992): 201–203. 2. For more information on the Words of Mormon, see Book of Mormon Central, “Why is ‘Words of Mormon’ at the End of the Small Plates? (Words of Mormon 1:3),” KnoWhy 78 (April 14, 2016). 3. Verse 11 seems to be the logical ending point of the first part of the text. See John C. Thomas, “Words of Mormon,” in Book of Mormon Reference Companion, ed. Dennis L. Largey (Salt Lake City, UT: Deseret Book, 2003), 793. 4. This verse seems to state the purpose of the book. 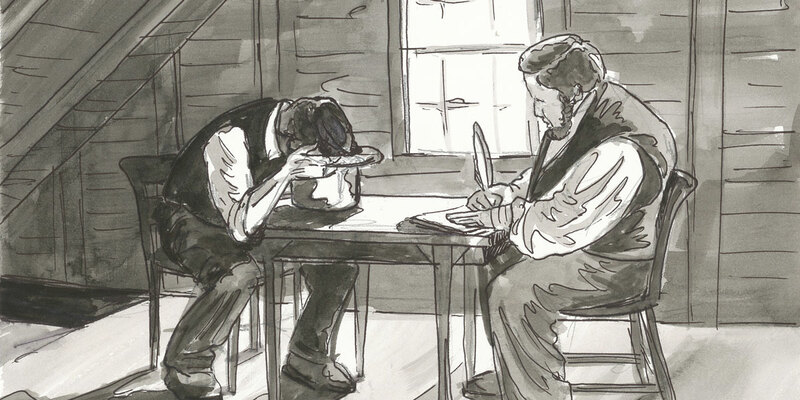 See Victor L. Ludlow, “Scribes and Scriptures: Enos, Jarom, Omni, and the Words of Mormon,” in Book of Mormon, Part 1: 1 Nephi–Alma 29, Studies in Scripture: Volume 7, ed. Kent P. Jackson (Salt Lake City, UT: Deseret Book, 1987), 202–204. 5. See Brant A. Gardner, Second Witness: Analytical and Contextual Commentary on the Book of Mormon, 6 vols. (Salt Lake City, UT: Greg Kofford Books, 2007), 3:97. 6. Lyon and Minson, “When Pages Collide,” 128. 7. For an analysis of the manuscript evidence, see Royal Skousen, ed., The Printer's Manuscript of the Book of Mormon, Part One: 1 Nephi 1–Alma 17, The Book of Mormon Critical Text Project, Volume 2 (Provo, UT: FARMS, 2001), 284. To actually examine a high-resolution image of the manuscript, see Royal Skousen and Robin Scott Jensen, eds., Revelations and Translations, Volume 3, Part 1: Printer's Manuscript of the Book of Mormon, 1 Nephi 1–Alma 35, The Joseph Smith Papers (Salt Lake City, UT: Church Historian's Press, 2015), 252–253. 8. Lyon and Minson, “When Pages Collide,” 123. 9. Lyon and Minson, “When Pages Collide,” 127. 10. Royal Skousen, The Original Manuscript of the Book of Mormon (Provo, Utah: FARMS and Brigham Young University, 2001), 34–36. 11. Lyon and Minson, “When Pages Collide,” 131. 12. For a response, see Brant A. Gardner, “When Hypotheses Collide: Responding to Lyon and Minson’s ‘When Pages Collide’,” Interpreter: A Journal of Mormon Scripture 5 (2013): 105–119. 13. For a thorough discussion of how the large and small plates go together, see Eldin Ricks, “The Small Plates of Nephi and the Words of Mormon,” in Jacob through Words of Mormon, To Learn with Joy, The Book of Mormon Symposium Series, Volume 4, ed. Monte S. Nyman and Charles D. Tate Jr. (Provo, UT: Religious Studies Center, Brigham Young University, 1990), 214–218. 14. Joseph Fielding McConkie and Robert L. Millet, Doctrinal Commentary on the Book of Mormon, 4 vols. (Salt Lake City, UT: Bookcraft, 1987–1992), 2:125. 15. Stephen D. Ricks, “Benjamin,” in Encyclopedia of Mormonism, ed. Daniel H. Ludlow (New York, NY: Macmillan, 1992), 1:99–100. 16. Hugh Nibley, Teachings of the Book of Mormon, 4 vols. (Provo, UT: FARMS, 1993), 1:437.